Aviation Security – КП "Аеропорт Вінниця"
WARNING! In order to ensure the safety of civil aviation, all flights at the airport are subject to security controls. All passengers are subject to security controls for their hand luggage, luggage and all personal belongings. WARNING! Passengers who have not passed the control of aviation security or have not submitted for this hand baggage, luggage and other belongings belonging to them, before boarding an aircraft are not allowed. 4. Put all your belongings (bags and baskets) on the moving part of the conveyor and wait for the aviation security personnel to go through a stationary metal detector. Rocket launchers, light signal devices, gun pistol building and assembly, gas balloons containing nerve-paralytic, tear-off, poisonous and potent gases. Electron beam weapons of all kinds. pyrotechnic means: signaling and lighting missiles, falsifiers, smoke chutes, landing checkers, thermic matches, matches of a fuzzer, railroad petards, Bengal lights, fireworks lights, luscugels, pyrotechnic household items and similar items and homemade tools and products. Gases are compressed and liquefied for household and industrial use – propane-butane, nitrogen, neon, argon, oxygen, chlorine, except those transported by medical brigades to provide emergency care to the population. Highly flammable liquids – gasoline, kerosene, acetone, methanol, methyl ether, brake fluid, carbon disulfide, ethers, organic solvents, all types of adhesives and sealants containing flammable (flammable) components. Industrial nitrocellulose is dry, colloidal and moist, regardless of the solvent content. brucine, nicotine, strychnine, formalin, antifreeze, ethylene glycol, mercury, cyanide preparations, cyclone, cyanobate and substances with similar properties. chemicals for removing varnishes and paints from the surface covered with them. Radioactive substances and materials of any degree of potential risk, form of manufacture or physical state and physical properties. All other substances, compounds and objects subject to the above-mentioned features, as well as those to which the manufacturer distributes special storage, transport and use conditions that are in doubt as to the safety of their carriage, as those that can be used for an explosion, fire or creating another threat to the safety and security of the lives and health of passengers and crew members of the aircraft. Firearms (including combat, hunting, sports), pneumatic, gas weapons, pistols and revolvers intended for the shooting of cartridges equipped with rubber or similar balloons, cold weapons of all kinds and constructively similar products, cartridges and spare parts to weapons, as well as educational, cleaned up, museum, souvenir, collection and firearms, in the presence of a natural or legal person with an appropriate permission for its storage, carriage and transportation, guns and pistols for the underwater floor tion. The transportation of weapons is regulated by an instruction approved by the central body of executive power in the field of transport. objects with blunt ends, which can cause bodily harm. WARNING! 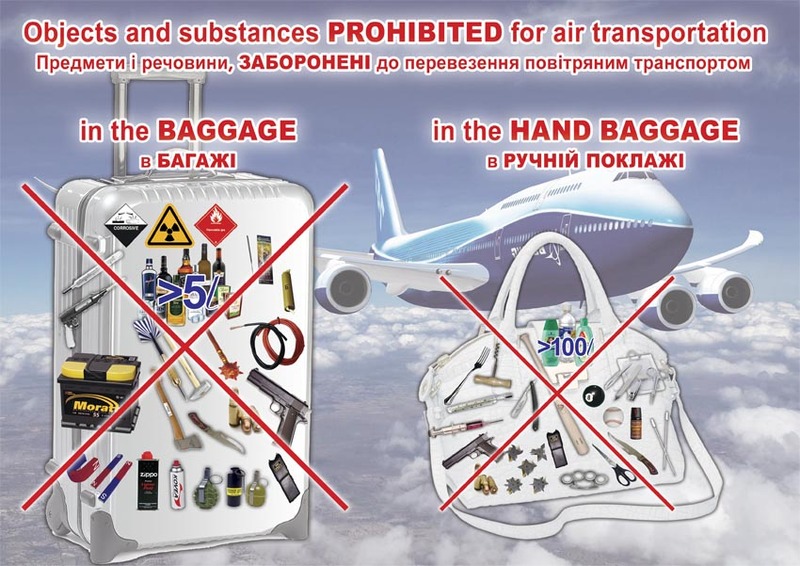 Transportation of baggage of passengers and crew members of electronic cigarettes and chargers to them is prohibited. WARNING! All spare lithium batteries must be carried in hand luggage and protected from short circuits. Equipment with lithium batteries should be protected from damage and unintentional activation. Limits in watts (W) for electrical equipment under the voltage on board passengers – maximum speed for 100 W / hour electrical equipment and 160 W per operator permission. All liquids must be transported in containers of not more than 100 ml capacity (or equivalent capacity in other units of measurement), liquids in containers of more than 100 ml capacity are not accepted until they are transported, even if only partially filled containers. Capacities should be placed in a transparent plastic bag that is subject to security controls and should be in a capacity not exceeding 1 liter of capacity should be placed in a transparent plastic bag that should be tightly closed. The plastic bag must be presented for visual inspection at the control point. Each passenger is allowed to have only one transparent plastic bag. 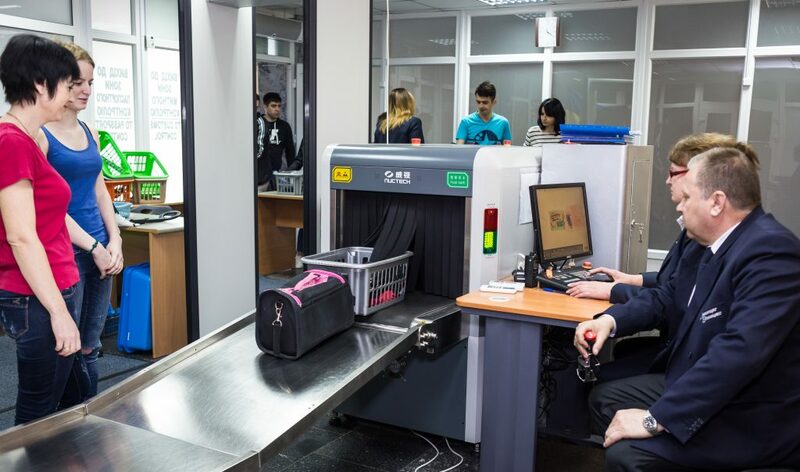 Transportation of medicines and dietary equipment in hand luggage is agreed in advance with the passenger with the representative of the airline – the carrier (operator). In advance of departure, a passenger who is ill and needs to use drugs (or injections) during a flight must notify the representative of the carrier – air carrier (operator) and obtain information about the mandatory presence of appropriate medical documents. Hand luggage is allowed to carry medicines (including syringes or other means for injections), without which the passenger can not do during the flight for medical reasons: insulin, antihistamines, painkillers, and the like. The need for admission and the number of medications are determined by the physician based on the duration of the flight and indicated in the corresponding medical certificate with a personal wet seal of the doctor. Parents with infants may take on board a child’s baby food in the amount necessary for the child during the entire flight. When passing the aviation security controls, passengers carrying hand baggage (including syringes or other injection devices) must warn and provide the appropriate medical certificate to the safety officer at the security control point, which causes the representative of the airline to coordinate the transportation of these items. Upon confirmation by the representative of the airline of the possibility of transportation of hand luggage drugs and passage of the passenger control procedures for aviation security, it is allowed to fly. Depending on the physical condition of the passenger (availability of relevant documents, certificates, etc. ), the airline representative – the carrier (operator) has the right to deny the passenger transportation or to authorize his transportation. NOTE: Airlines may have additional restrictions on carriage in certain areas. We advise you to familiarize yourself with the rules of aviation security on the official website of the airline, which will carry out the flight.